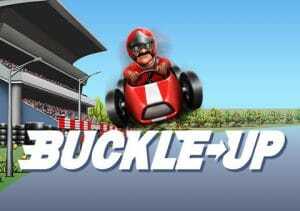 Rev up your engine and take a trip around the race track in Buckle Up. This motor racing-themed video slot comes from Playtech and is played using a 3 reel, 26 payline game engine. Boasting cracking sound and visuals, look out for the Booster Reel that delivers 1 of 4 modifiers following every winning spin. Play on your PC, tablet or mobile from between 25p and £1,875 per spin. You won’t see many better-looking games than Buckle Up. The reels feature chequered flags, bottles of bubbly, a racing driver’s helmet, a racing driver and a pit lane girl. The most rewarding symbol is the portly driver who awards 1.6 times your bet if you land 3 in a row. The tyre is the wild. It replaces everything bar the trophy. When the wild lands, it expands and fills the whole of the reel. Hit 3 wilds on a payline and you’ll receive a 1.6 times your bet payout. Extra Wild Booster feature – a stacked wild lands on reel 1. Level Up Booster feature – the symbols in the successful combination are upgraded to the next value symbol. Extra Symbols Booster feature – losing symbols on the triggering spin transform into the same symbol as the winner to create a new and expanded winning combo. Multiplier Booster feature – a multiplier is applied to your win. This can send a payout rocketing by up to 25x. Get really lucky and you could end up with more than 1 Booster on the same spin. What you ideally want is big multiplier from the Multiplier Booster feature as well as a wild reel from the Extra Wild Booster feature! The other symbol you’ll see spinning around the reels is the trophy. Land 3 of these and you’ll trigger the Circuit Complete feature – you’ll also win an award equal to 80 times your total bet and unlock the Jungle Circuit. Land 3 scatters while driving the Jungle Circuit and you’ll receive a 100 times your bet reward. You’ll then unlock the Beach Circuit where payouts of 120 times your bet are on offer. Finally, there’s the Night Circuit where 3 scatters will get you a payday of 160 times your bet. Not being petrol heads in any shape or form we weren’t expecting much from Buckle Up. It certainly exceeded expectations though. The visuals are superb and you’ll hear the roar of racing car engine blaring away as you spin. Despite the lack of traditional features or free spins, the modifiers on offer from the Booster Reel delivers plenty of action. Even if you’re not a racing fan, there’s more than enough here to make us want to Buckle Up. I also suggest you try Bally’s Wacky Races which has some similarities.